I think I'm going to buy the game this weekend. Just a quick question - are the practice programmes different this year? It's more immersive. Apart from the 5 practice programmes that we had in last year's game, this year there's even ERS Management programme (although haven't tried it still). We get more resource points through these & the contract negotiations can up the resource points received. The graphics & physics are much better, the media interaction with Claire has an advantage when it comes to getting parts from specific departments or attracting other teams depending on Your answers which would either tilt towards Sportsmanship or Showmanship. We have Russia & Germany tracks as well which are fun. A small clip from my career race at Belgium. While defending against Raikkonen, he gets a little touch & spins. He takes ages to recover & join the track, only to be slammed by Vandoorne. Love the aggressive AI in the game. You have to leav-a da space - all the time, you have to leav-a da space! Racing incident, but I'd have to say you squeezed him a little too much at the apex. His car was pretty much along side when you turned in. I bought the game and have just completed my first career race. I chose Force India as my team and Ocon as my teammate. I had AI difficulty at 88% and race distance as 50%. I qualified 10th and finished sixth in the race, a bit of a messy race for some. An early safety car caused by Verstappen blowing up (insert joke here) saw all the Ferrari's and Ricciardo pit, whilst myself and the Mercs stayed out. A VSC on lap 8 then meant that I could take advantage and come out of my pit stop ahead of the Ferrari's. It took them until lap 27/28 to catch me before passing quite easily - it surprised me it took them so long to catch me, I was probably only ~10 seconds ahead when I left the pits. Another late safety car probably saved me from being passed by Ricciardo. First impressions of the game are that it is great and I'm looking forward to playing it more. I think I need to up the AI difficulty a little though. And for those of you who have played career mode - how often do you get interviewed? I got interviewed after P1 and the race in Australia and am just in qualifying at Bahrain and have yet to be interviewed. Does that sound normal? I've also just noticed something a little strange. 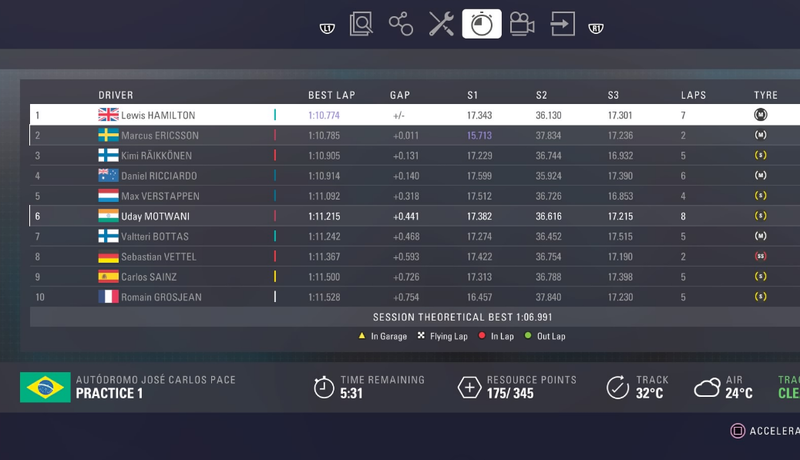 After finishing Q2, Ocon's time in the summary was different to what it said when I went to the race director screen. Ocon out qualified me (both times were better than mine) but I got the rivalry point for doing a faster lap in qualifying. 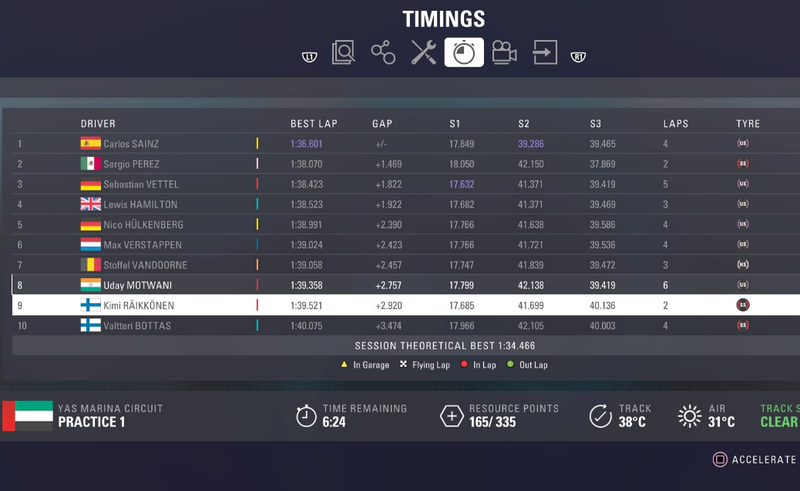 I've also noticed that the time being shown for Vettel isn't as fast as another lap he did in the session when looking at the race director screen. Has anybody come across these things? You'll get interviewed if You've exceeded the team's expectation either in qualy or race. If You've gotten a lackluster result, she won't care abut You! Putting some funny & crazy videos from my recent gameplay at the Italian Grand Prix (career mode)! Finally got back on F1 2018, got distracted with some other games lol. So I am currently at Baku circuit. Coming into Baku my first major aero upgrade FAILED!! So I have to wait another race weekend and my chassis upgrade is still in development. But my engine upgrade has arrived and what a great track to test it out. My top speed has increased by a whopping 4mph lol. In qualifying the target was 13th based on the testing which I beat the time by .200 so I felt good going in. Q1 leclerc and I are identical p12/p13 separated by .050. My first run in Q2 was terrible and left .400 on the table compared to Q1, leclerc improves .200 on his time. I trim (-1) on front aero, slap on fresh rubber and wait late in the session. I join in behind Verstappen who gives me a great tow down the first 2 straights and let’s me by, already at (-.5) faster. Then just past that I catch Hulkenberg who gives me another tow through the entire sector 2 and let’s me by (-1.3) faster. Now I’m in clear air all the way down the main straight give it everything cross the line P7!!! First Q3 appearance. Q3 I wait late in the session once again and only make 1 attempt. Wouldn’t you know I join behind Verstappen once again for the same 2 tows lmao. But that was the only help I got this time ended up P8. Best quali so far and I have aero, chasis & mgu-k upgrades coming for Spain. I haven't noticed it in particular. How big of an improvement are we talking? I think it should be 3-4 tenths based on track improvement. I noticed something a bit odd myself in my most recent qualifying session. It was in Canada, a wet-to-dry session. In practice the top cars were running low 1:10s for quali sims, with the estimated pole time being 1:10.2-something. On a drying track - hypersofts, but visibly not completely dry - suddenly everyone is doing 1:09s. I was quite puzzled how a drying track actually has more grip than a fully dry one! On that note, I've decided that I probably need to turn up my difficulty. I qualified P5 in the end, ahead of both Red Bulls, in my Sauber. Leclerc was back in P13 or something. It's a bit of a mixed bag, since last time out in Monaco I qualified P19 and crashed on lap 2 - but that's because I'm terrible in Monaco, and I know it! I also need to work on my wet weather driving. My advantage over Leclerc totally disappears in the wet, and we become evenly matched. Almost every YouTuber I've watched play F1 2018 says the AI is slow in the wet, but clearly what they're not accounting for is that some players are also slow in the wet. I can't speak for this game but one thing I definitely did notice on F1 2017 is that if you're in the garage in qualifying and the AI are out on track on softs they will do soft times regardless of how wet the track is but if you were out on track the conditions did affect the AI like normal. I always hated wed/dry qualifying sessions for that reason and often crawled around the track for a few laps after setting my time to make sure I was out until the other cars pit for wets. Could be the same bug carried over to this year. Nah, I was out for it too, and I did a 1:19.5 - almost a full second faster than my Q2 time. It was just weird! I've decided I need to up my difficulty level after Canada, where I qualified P5 in a Sauber (3rd worst car), lapped my teammate, overtook both Ferraris and finished on the podium. I want to be quick, but that's too quick. When I move to a better team next year, I will presumably be lapping the field. So my question is, how much is each increment of difficulty? I seem to be on average 1-1.5 seconds per lap faster than Leclerc, throwing out Monaco where I was terrible. How many clicks up is that? I seem to recall from my initial testing that 10 points roughly equals 2 seconds per lap. If that's still true, I suppose I'd want to go up by about 5 clicks? I'd ideally want to set it so that I'm on the same pace as Leclerc with an average performance, faster with a good performance and slower with a poor one. I've decided to gather a list of quick impressions I've had from playing the game for a while now, including some that I find are interestingly enough completely at odds with what seems to be common knowledge for the game. 2) I find that the AI is mildly quicker in qualifying than in the race, but not by a lot. I can be pretty much guaranteed to move forward from my starting position. This may be due to the fact that I'm a poor qualifier, however. 3) The full wet driving is very hard, but I like the inter conditions. As above, I am certainly a poor wet weather driver, so this might color my opinion. 4) Managing ERS modes makes a big difference, much more I feel than managing fuel modes. On the subject of which, I'm starting to wonder if this is a Fanatec - possibly even CSL or McLaren rim - specific issue. I should probably do some looking to see if anyone else has the same problem, but what happens is basically this: at some point during the race (it doesn't happen in practice or qualifying) I will go over a kerb or make a sudden correction. Force Feedback cuts out entirely, leaving the wheel floaty and numb, before returning some time around the next braking zone. After it has happened once, the problem will continue to randomly re-occur throughout the race, usually once per lap in the exact same place as it happened previously. It is only fixed by turning the wheel fully off and back on again. If anyone can give any advice on the wheel problem, I would really appreciate it! It makes it much harder to enjoy the game, and probably costs me about 2-5 tenths a lap when it's happening, in addition to usually requiring flashbacks to fix when I crash. What difficulty do you play Exediron? On last year's game I noticed a bit more of a noticeable step up when you get into the next 'band'. So 101 (ultimate) feels faster than 100 (Legend) for me. Again I can't really speak for this game because I've done 2 races in career mode and played around with the classic cars, but if your close to the next band you might want to just get into it and give that a try. Assuming its completely linear this year, or that you're already in the middle of a band, I found if you felt fairly comfortably superior then 5 clicks would make it a bit more challenging, but it sounds like you're a lot quicker than you want to be so 10 clicks might be better for you to start with. I started on 101%, after doing a few quick race tests and finding that somewhere around 100% was where I was comfortable with. I think where I went wrong with that is that I was doing those quick races on a default setup, and while the default setup for F1 2018 feels good, it's still a lot slower than a more perfect setup. I guess next time I get on the game I'll try upping it to 105% and see what that's like - although the next track is France, so I have no idea if it'll be a good one for me or not. I've never driven even a single lap there! I do find the AI is faster in quali then in race trim. For the race I up the difficulty 4 clicks and then return it back to normal after the race. If you feel it’s too high you can quit to main menu and change the settings when you are loading into the race again. Guys, don't forget to try the event! Just had a very strange Chinese GP. All throughout practice the car felt nice and planted in the high speed corners, I had problems with the back end stepping out at T1 on 2017 so I was using a fairly low ballast (7) and it seemed to be doing the trick. Flew through my practice programmes and skipped P3 as I already had the resource points, qualifying programme predicted a P9 position and it wasn't the best lap so I was pretty confident. Came to qualifying and the car was awful, back end stepping out in T1 and the fast left/right in the middle sector. Only managed to qualify 16th. Got a good start and got into P12 ahead of my teammate Vandoorne, felt good to start with but then there was a safety car and I simply couldn't keep temperature in my tyres behind it so when we got going again it was like driving on ice but the AI were up to speed immediately. Luckily I was pretty good through the corner leading onto the back straight and the last turn so the AI didn't get much opportunity to overtake while I got my tyres back up to temperature. Towards the end of the stint the softs felt awful and I was struggling not to spin in the high speed corners again, pit and put on the mediums and the car was well balanced again all the way to the finish, ended up P10. Very weird race weekend with the car feeling completely different qualifying onwards. Has anyone else had issues with keeping tyre temps behind the safety car? For starters, have excluded safety car from my career game as F1 2017 safety car bug got me crazy. As for tyre temp issues You faced, this year's game has had a lot of impetus on tyre temps & performance. It should be in everyone's skill set now to look after their tyres & keep the temp of the tyres in the right window. I too struggle with tyres though. In F1 2017, tyres were always planted but in 2018 version, tyres start to wear sooner if not taken care of. Be weary of street circuits. What was the F1 2017 safety car bug Uday? I can't recall it. When behind the safety car, the AI behind You would overtake You & if You would try to reclaim the position, You would get a warning to give the position back if not done so in 15 seconds! Te scenario was same under VSC. The AI would gain time or make time on You. They also were known to overtake You & You couldn't do the same. Oh man Baku was rough. The signs were there from pretty early on, I was watching Limitless' hotlap/setup video and thinking 'man the braking distances he's saying are way too early', then I realised he's in a Mercedes not a McLaren so he arrives around 10mph quicker at the corners. Car felt good and I was competative in the middle sector, was around half a second per lap quicker than Vandoorne but we finished last and second to last, easily the slowest cars on track due to losing too much time on the straights. I got the full Alonso experience I guess. Waiting for Your experience racing around Paul Ricard. Going with a new gear box for Monaco and new power unit for Canada. Last 2 laps from my event run. Made a couple of small mistakes which gave Vettel a good run on me and led to a nice little battle. @Mayhem - Replied to You on PS4 but don't know if You received the message. As for Your query regarding the glitch, it's a well known glitch where certain AI cars go below the 1 minute mark at Monaco! Luckily, the glitch You faced & that I'm being facing is only existent in Practice sessions! After installation of 1.10 patch my practice sessions since Brazil are going haywire. 1 AI will post an incredibly fast time in a certain sector which would only be possible if a corner would be cut. 1 of the screenshots included below shows Ericsson (my team mate) posted close to the fastest time on the slowest tyre. I did get ur msg on PS4 thanks..... for those who don’t know about it, the AI posts sub 1min times in Monaco which in turn will make your race pace & quali objectives be at a much faster time since the AI time does set the tone of where you should be. I noticed that in Hungary @Uday - Hamilton was 2 second quicker than anyone in S1 but lost all the time in S2 so it evened out. I really do enjoy these games but there are glitches every year, I guess they just can't be avoided.